India Furnish Designer Blue Eyelet Polyester Curtain Long Door Length (Set of 8 Pcs) 108" x48"
India Furnish deals with beautifully designed & stitched curtains that you will simply love to buy to make a perfect match for the Long doors of your home & indeed a worthy buy that will make your room look rich and luxurious. 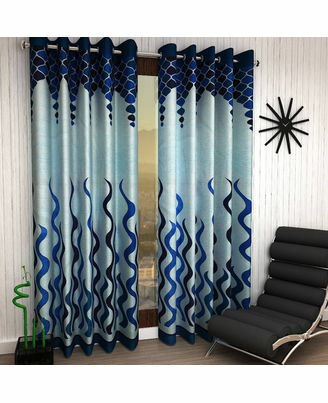 These curtains are made with premium quality 100% polyester fabric which is strong and durable.The design & color of these curtains will complement your home decor and will provide an elegant appeal to your home interiors. These curtains are lightweight and can be moved over a curtain rod without any hassle.These curtains come with fine quality metal eyelets making it very convenient for you to install or uninstall the curtains. Curtains have been stitched on most modern machines to the perfection and crafted with metal eylets which will be easy to use and light in weight. We have listed most of our curtains in all three sizes.Good quality, Best price, Value for money & an Excellent buying experience. Buy today & cherish for life!! Discussion:India Furnish Designer Blue Eyelet Polyester Curtain Long Door Length (Set of 8 Pcs) 108" x48"